I’ve never really been big into soups but I’ve been wanting to use my immersion blender more. It always seemed cool to stick the blender into a pot and mix up a soup. 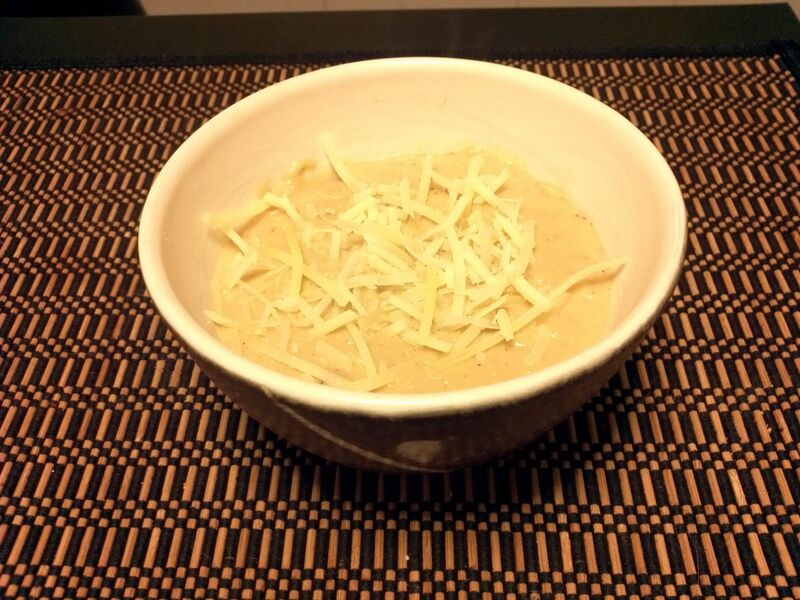 I underestimated how good soup could be and this one turned out really well. It can be a great side or even become the whole meal! 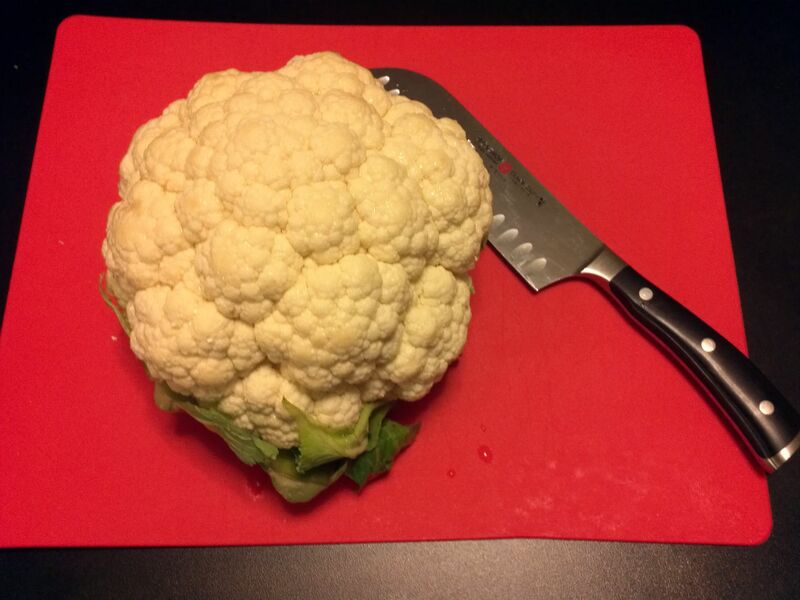 Start with a whole head of cauliflower. Rinse it off and cut it into chunks. The green stuff all gets thrown away. 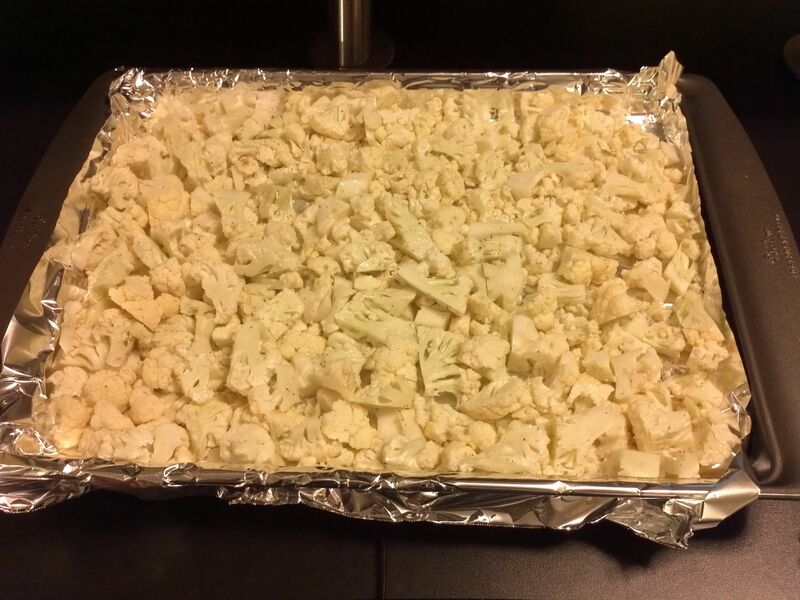 To cook the cauliflower, I lined a pan with foil and placed it all in there. Then I drizzled it with olive oil and added salt and pepper. I then mixed it all around to spread out the spices and olive oil. This then went in the oven to cook. 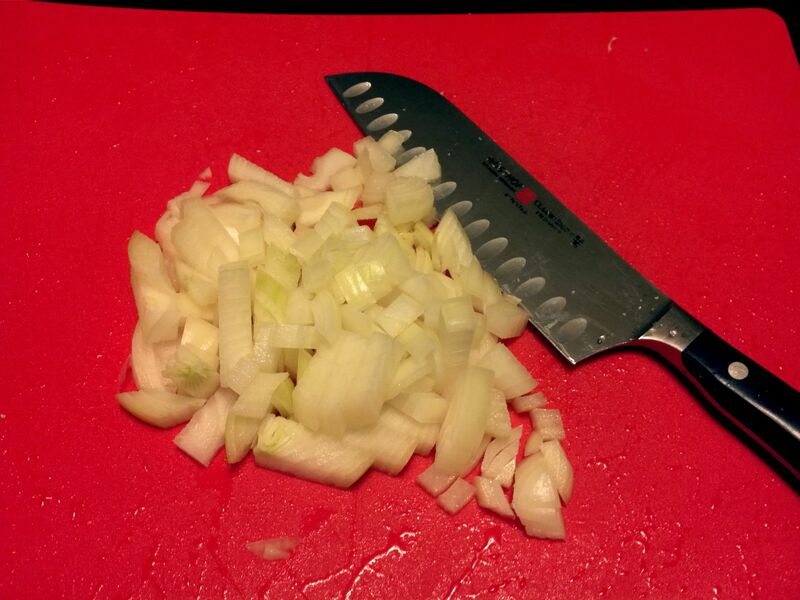 Next, dice a medium onion. It will all get blended anyway so the size and shape of the cuts are not too important. Now for the bacon! 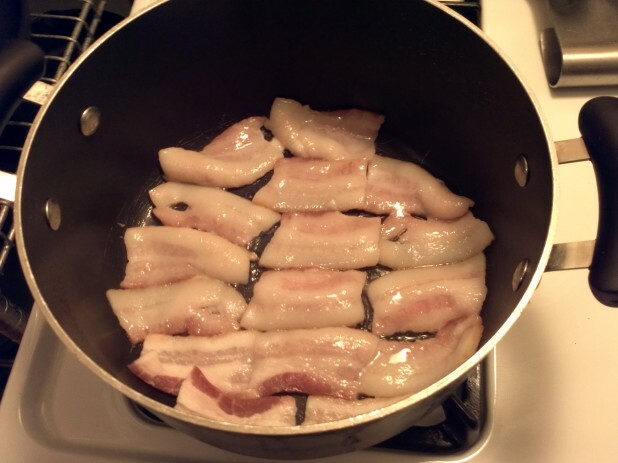 I cooked the bacon in a pot because I only wanted to use one dish for the whole meal. I chopped them up a little bit so it would fit easier. 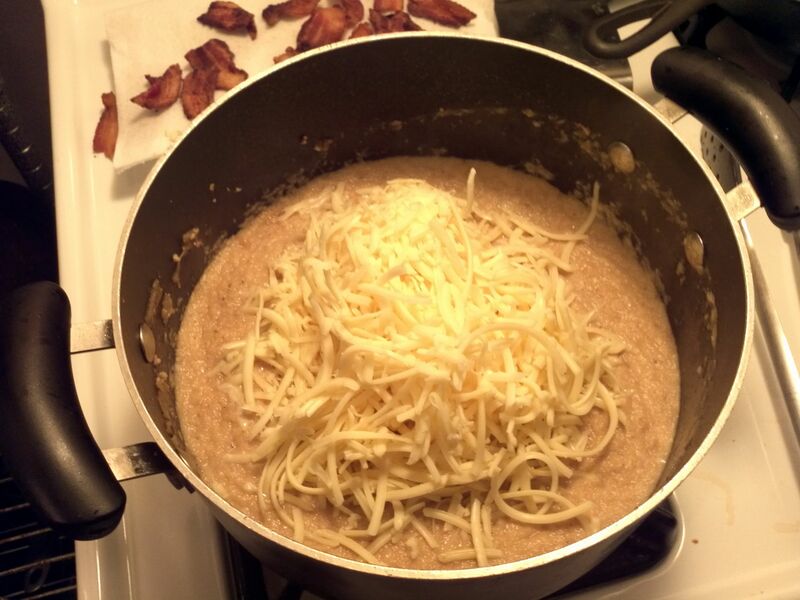 While the bacon is cooking, we can work on the cheese. 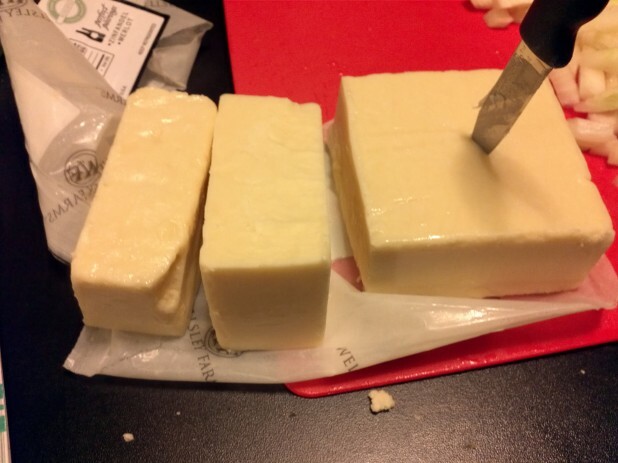 This recipe is best with an aged cheddar. Here I used 3 year aged cheddar. Shred the cheddar using a food processor. 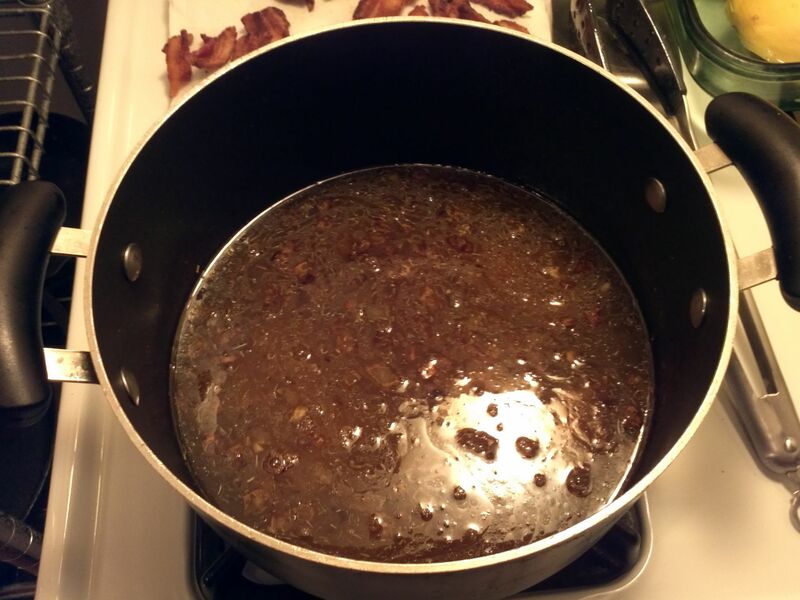 When the bacon is done, remove it from the pan and keep the bacon grease intact. Then throw the onions in and cook them until translucent. Once the onions are done, throw in the garlic and thyme and cook for a minute or so more. You don’t want to burn the garlic. Now time for the chicken broth! 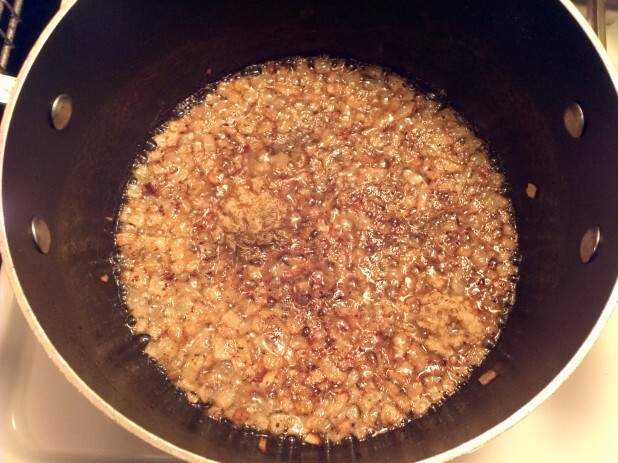 Add the chicken broth to the onion, garlic and thyme mixture and deglaze the pan. Bring the liquid to a boil. 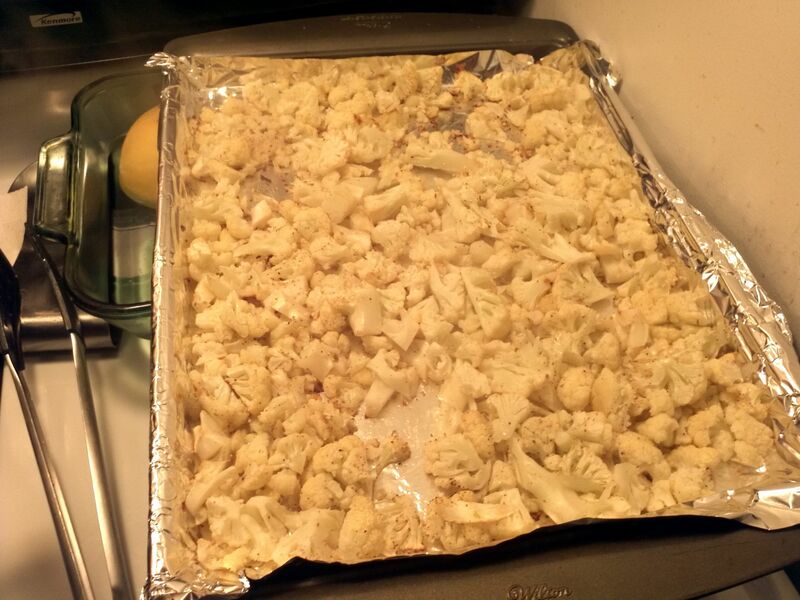 At this point, the cauliflower should be properly roasted and starting to brown on the edges. 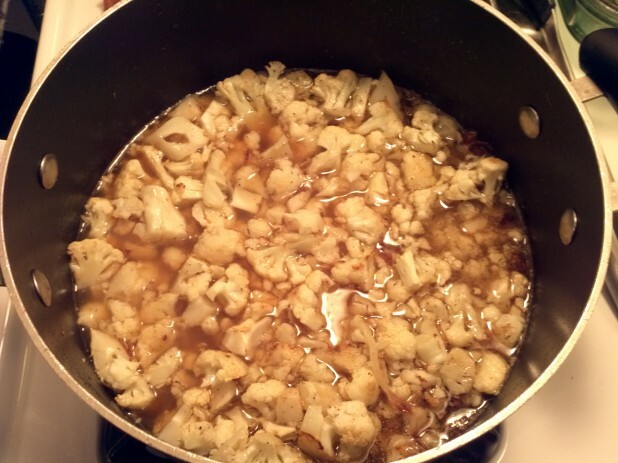 Throw the cauliflower into the liquid, cover, and simmer for 20 minutes. Now comes the fun part! After the cauliflower has been simmering, get out your immersion blender and start blending! You basically just stick it in there and hit the button! 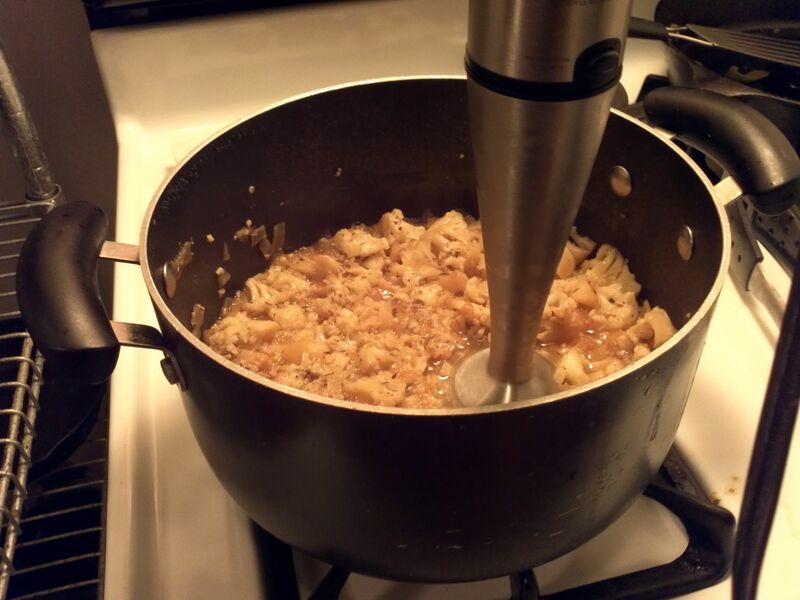 At first you might need to pull it all the way out and push it on top of the cauliflower to break it up. 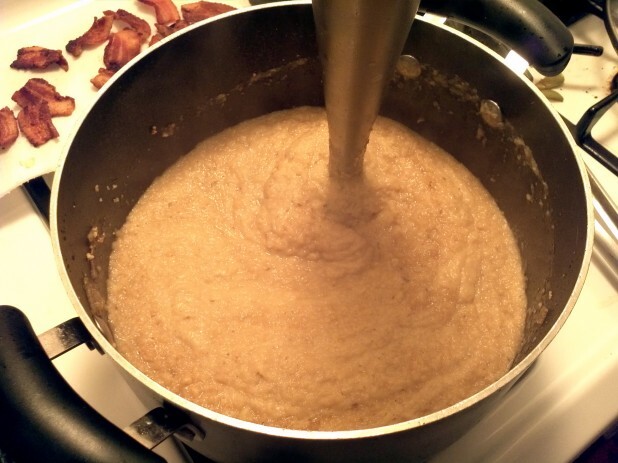 However, once it gets started it will blend it almost automatically. 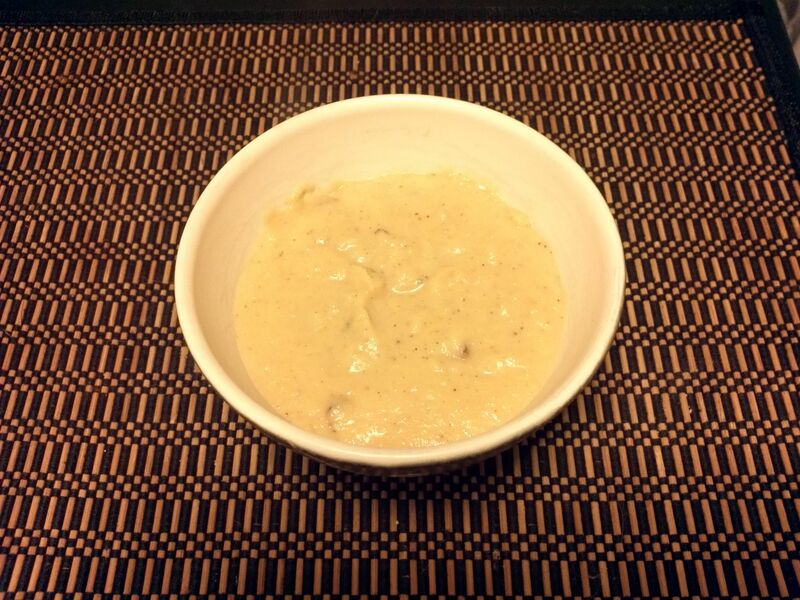 Here’s the fully blended cauliflower. 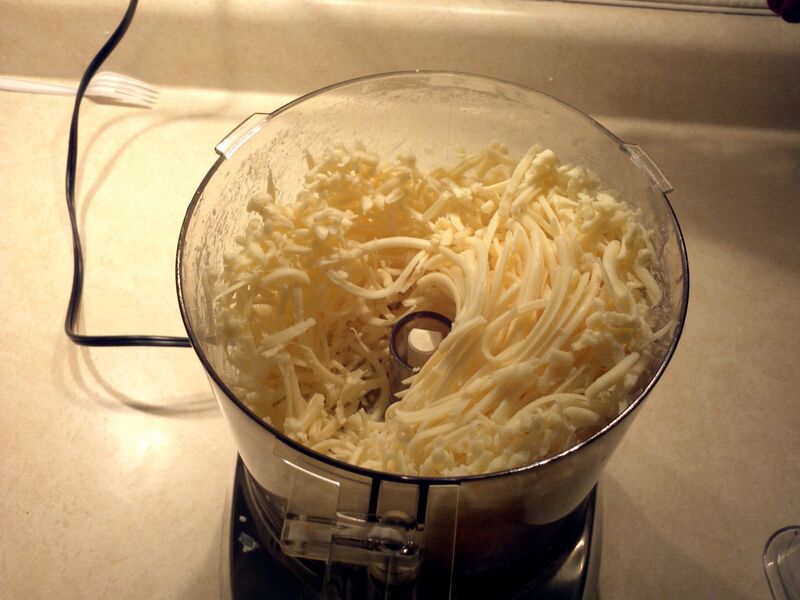 Next, throw the cheese in there and blend again! After the cheese, crumble the bacon and mix with a spoon. That’s it! Optionally you can add some shredded Parmesan on the top. This looks great! Have you ever made it with broccoli instead of cauliflower?- if so, how’d it turn out? I made this with broccoli today and it was one of the most fantastic things I’ve ever eaten. 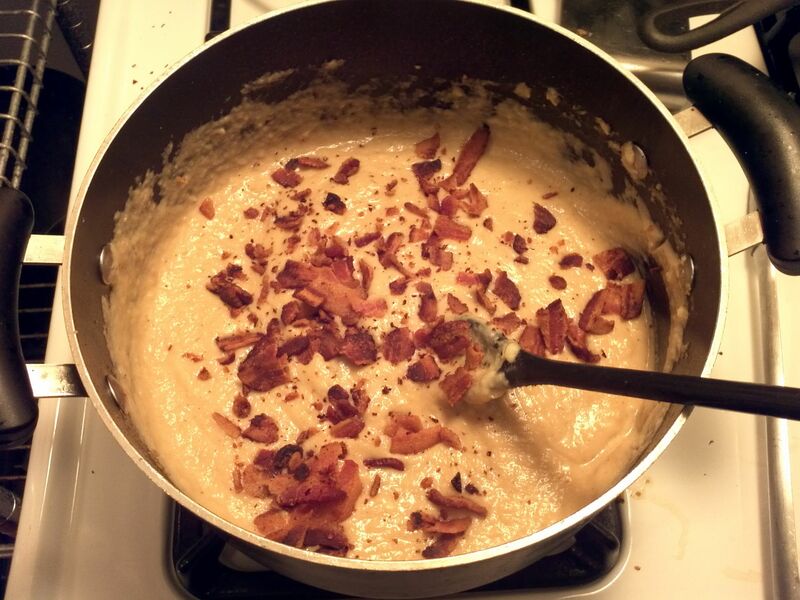 I’ve made cauliflower cheese soup a bizillian times and never once ever thought to put bacon crisps into it. I KNOW that’ll be a winner! LOVE that idea! Maybe you’ll see this even though it’s an old post… was just wondering how it reheated? I love soup but it’s just me so I’m always cautious about making a big pot of it. Just made this tonight! Very excellent and delicious. I used aged yellow cheddar instead, as well as a generous portion of parmesan cheese. 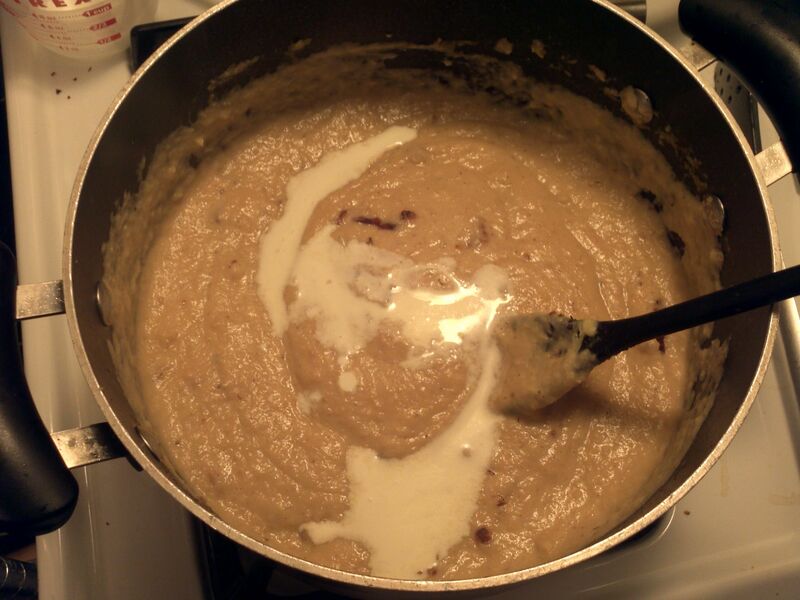 I don’t own an immersion blender so I blended the soup in an actual standing blender, about 2 cups at a time. Worked perfectly and tastes great. My Family loved it!! Was a big hit this weekend!! I was told next to double the recipe!!! 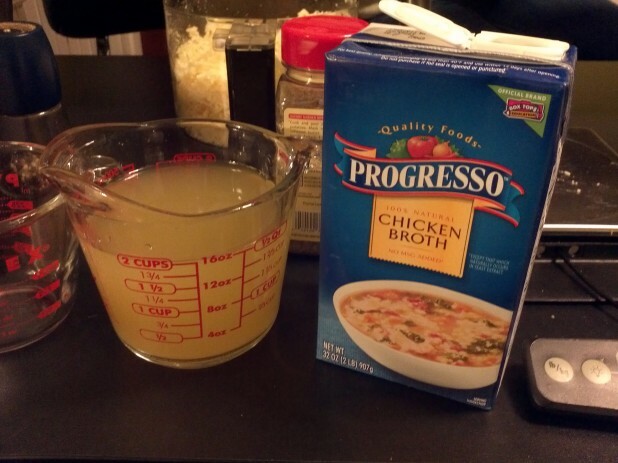 I just made this soup for lunch, thinking I might be able to fool my picky-eater husband into trying something new. I made zero mention of cauliflower…HE LOVED IT and stated that he would “eat cauliflower all day” if I “make it delicious”. I don’t have kids, but you could probably trick yours into eating this. Either way, it’s AWESOME. I just made this and added in a roasted red capsicum and it is delicious. This soup is the bomb! 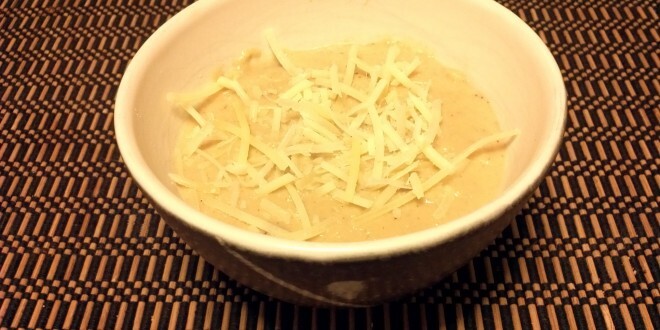 Awesomely creamy, tons of flavor. Will definitely make again.